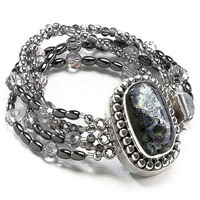 The glisten of mirror-finish glass beads is complemented by the smoky colors of hematite and the sparkle of crystals in this five-strand bracelet . The large, multiple-strand clasp takes the design from simple to smashing. Like any great centerpiece, the clasp is a wonderful accent that pulls in a multitude of colors without overwhelming the delicate strands. This design is excerpted from the book Big & Bold, How to Make Dramatic Beaded Jewelry. The finished bracelet is 6-3/4 inches. Cut five strands of flexible beading wire 5 inches longer than the finished length of 6-3/4 inches. String a crimp bead and a 3-mm bead on a wire and go through the center strand of a three-strand clasp. Go back through the beads just strung, tighten the wire, and crimp the crimp bead. See how to crimp a bead link below. String a crystal over the working wire and the tail. String three ovals and a crystal and repeat this pattern five more times. String a crimp bead and a 3-mm bead and go through the center loop of the remaining half of the clasp. Go back through the last three beads and tighten the wire. Check the fit. (Make this bracelet snug so the clasp stays on top of your wrist.) Crimp the crimp bead and trim the excess wire. Repeat step 1, stringing through the clasp's top loop. String 3-mm glass beads until the strand is the same length as the center strand. Finish as in step 3, attaching the strand to the clasp's upper loop. Repeat step 1, again stringing through the clasp's top loop. Work above the finished strand. String two ovals, a crystal, three ovals, and a crystal, repeating the pattern five times. End with two ovals. Finish as in step 3, attaching the strand to the clasp's upper loop. Repeat steps 4 and 5 through the clasp's lower loop, placing the oval and crystal strand below the 3-mm strand.